Solomon’s wisdom exceeded that of everyone before him. The book of Proverbs is a remarkable distillation of that wisdom. Its purpose is clear: “For attaining wisdom and discipline; for understanding words of insight; for acquiring a disciplined and prudent life, doing what is right and just and fair; for giving prudence to the simple, knowledge and discretion to the young” (verses 2-4). Proverbs is written from the standpoint of a father instructing his son. It contains many instructions on avoiding immoral women and on living happily with a wife. Even wisdom (Hebrew: chokhmah) and folly (kesiluth) are personified as women. Of course, the principles conveyed — avoiding immorality, deriving enjoyment from your marriage, seeking wisdom and spurning folly — apply equally to men and women. Solomon first warns against falling prey to the enticement of sinners (verses 10-19). No matter how alluring the life of the criminal looks, its end is a violent death: “These men lie in wait for their own blood; they waylay only themselves! Such is the end of all who go after ill-gotten gain” (verses 18-19). 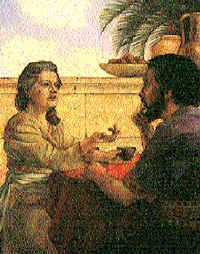 Then Solomon portrays wisdom as a woman speaking in the street. In a parallel structure, wisdom twice reproaches the foolish for not listening to her (verses 24-25, 29-30) and then announces their consequent doom (verses 26-28, 31-32). This Proverbs is an intricately structured alphabetizing poem, 22 lines in length to correspond with the 22 letters of the Hebrew alphabet. After the introductory address, ” My son,” the poem is divided into six stanzas: verses 1-4, 5-8, 9-11, 12-15, 16-19 and 20-22. The first three stanzas begin with aleph, the first letter of the alphabet; the last three begin with lamed, the letter that starts the second half of the alphabet. Moreover, the first lines of each of these stanzas summarize the poem: “If you accept my words…then you will understand the fear of the Lord…. Then you will understand what is right and just…. Wisdom will save you from the ways of wicked men…. It will save you also from the adulteress…. Thus you will walk in the ways of good men” (verses 1, 5, 9, 12, 16, 20). This sort of formal structure is typical of wisdom literature and serves a practical purpose: It makes the point — that wisdom is invaluable — easier to remember. Solomon now gives a series of commands, each two verses long, about honoring and trusting God and about love and faithfulness (verses 1-12). Then follows another hymn praising the virtues of wisdom (verses 13-24). Wisdom’s value is so high that “she is more profitable than silver and yields better returns than gold” (verse 14). The Proverbs also contains a series of prohibitions (verses 27-32) against harming one’s neighbor. These ethical teachings go far beyond the literal demands of the law: “Do not withhold good from those who deserve it, when it is in your power to act” (verse 27). This ethical principle was expounded by the apostle James: “Anyone, then, who knows the good he ought to do and doesn’t do it, sins” (James 4:17). The book of Proverbs does more than give sound advice — it teaches a way of life. Solomon tells how his father, David, encouraged him to seek wisdom when he was a young boy (verses 1-9). He again stresses: “Wisdom is supreme; therefore get wisdom. Though it cost all you have, get understanding” (verse 7). Then Solomon contrasts the way of wisdom with the way of the wicked (verses 11-19). He encourages his son to keep his words with all of his being (verses 20-27). This Proverbs is an intentionally graphic poem, warning against adultery. Its metaphors strike home: “For the lips of an adulteress drip honey, and her speech is smoother than oil; but in the end she is bitter as gall, sharp as a double-edged sword” (verses 3-4). Description and implicit warning turn to explicit prohibition: “Keep to a path far from her, do not go near the door of her house” (verse 8). The apostle Paul later commanded: “Flee from sexual immorality” (1 Corinthians 6:18). This principle applies to every aspect of life: Get as far away from sin as possible. The poem also gives positive instruction: “Rejoice in the wife of your youth…. May her breasts satisfy you always, may you ever be captivated by her love” (Proverbs 5:18-19). God intended a husband and wife to find enjoyment in each other. We will later expound this theme in our commentary on the Song of Songs. Three short passages introduce themes that are developed further in the later part of the book: the foolishness of being surety for a friend (verses 1-5), the folly of laziness (verses 6-11) and the hatred God has for evil (verses 12-19). The last point is illustrated as a list of seven things that are detestable to God: “Haughty eyes, a lying tongue, hands that shed innocent blood, a heart that devises wicked schemes, feet that are quick to rush into evil, a false witness who pours out lies and a man who stirs up dissension among brothers” (verses 17-19). Notice that three of these involve use of the tongue — another important theme. Solomon likens sleeping with another man’s wife to scooping fire into one’s lap or walking on hot coals (Proverbs 6:27-29). A starving thief might be pitied, but a man who has committed adultery will not be shown any mercy by a jealous husband (verses 30-35). Proverbs 7 is another long poem warning against adultery. This poem uses an envelope structure — it begins and ends by exhorting the young man to hear his father’s instruction (Proverbs 7:1-5, 24-27). In between, Solomon describes how an immoral woman plies her craft: “I have perfumed my bed with myrrh, aloes and cinnamon. Come, let’s drink deep of love till morning; let’s enjoy ourselves with love! My husband is not at home; he has gone on a long journey” (verses 17-19). Again, the result of immorality is vividly portrayed: “With persuasive words she led him astray; she seduced him with her smooth talk. All at once he followed her like an ox going to the slaughter” (verses 21-22). In another chapter-length poem, Solomon again personifies wisdom as a woman proclaiming truth to those who would listen. Wisdom here makes some dramatic claims: “By me kings reign and rulers make laws that are just; by me princes govern, and all nobles who rule on earth…. The Lord brought me forth as the first of his works, before his deeds of old; I was appointed from eternity, from the beginning, before the world began” (verses 15-16, 22-23). Solomon now personifies both wisdom and folly. First, wisdom prepares a feast of meat and wine on a furnished table served by maids for all people who are willing to forsake folly and go in the way of understanding (verses 1-6). Folly offers her followers a short-cut: “Stolen water is sweet; food eaten in secret is delicious!” (verse 17). Yet this shortcut leads to death (verse 18). Notice also that folly can offer only bread and water, but wisdom offers meat and wine. There is ultimately far more satisfaction in going the right way. We do not have enough space to discuss all the diverse subjects contained in these chapters, so we will limit ourselves to several of the more frequently mentioned topics. We begin with a piece of sound financial advice that is often ignored: “He who puts up security for another will surely suffer” (11:15). If you guarantee to pay if someone else defaults on a financial agreement, be prepared to kiss that money good-bye. And if you do this on behalf of a stranger, then you have only your own folly to blame when things go wrong. As two of the proverbs say, “Take the garment of one who puts up security for a stranger” (20:16; 27:13). This does not mean that it is wrong to be surety for a friend, but it is risky. It is better to consider it a gift. If you are co-signer on a loan, you are taking chances. Judah offered himself as surety for his brother Benjamin (Genesis 43:8-9). He later offered to become Joseph’s slave in an attempt to ensure Benjamin’s safe return (Genesis 44:32-33). These courageous actions resulted in the joyous reunion of Joseph with Judah and the rest of his brothers. This example illustrates that the proverbs are not absolute laws, but wise instructions and general principles. This theme occurs right from the beginning of the book: “The fear of the Lord is the beginning of knowledge” (1:7). Both knowledge and wisdom are intimately connected with a respectful fear of God: “The fear of the Lord teaches a man wisdom” (15:33); and “The fear of the Lord is the beginning of wisdom, and knowledge of the Holy One is understanding” (9:10). Fearing God leads to the godly attribute of hating evil: “Fear the Lord and shun evil” (3:7); “To fear the Lord is to hate evil; I hate pride and arrogance, evil behavior and perverse speech” (8:13); and “Through the fear of the Lord a man avoids evil” (16:6). Those who fear God do not need to fear any human: “He who fears the Lord has a secure fortress, and for his children it will be a refuge. The fear of the Lord is a fountain of life” (14:26-27). Fearing God is to be preferred to having great wealth with trouble (15:16) because “the fear of the Lord leads to life: Then one rests content, untouched by trouble” (19:23) and “humility and the fear of the Lord bring wealth and honor and life” (22:4). In addition to being the major theme of the first nine chapters, the value of wisdom is discussed throughout the rest of the book. Solomon writes, “How much better to get wisdom than gold, to choose understanding rather than silver!” (16:16). In fact, seeking wisdom is wise: “He who gets wisdom loves his own soul; he who cherishes understanding prospers” (19:8). Another theme introduced earlier is the certainty of the sluggard, or lazy person, ending in poverty 6:6-11). Many proverbs repeat this message: “Lazy hands make a man poor, but diligent hands bring wealth” (10:4); “A sluggard does not plow in season; so at harvest time he looks but finds nothing” (20:4) and “The sluggard’s craving will be the death of him” (21:25). Two longer passages reinforce this point. One shows that sluggards will find the most outrageous excuse not to work and cannot be convinced of their folly (26:13-16). The other describes the property of the sluggard — broken down and overgrown with weeds and thorns — and warns that lack of diligence inevitably results in poverty (24:30-34). Conversely, the diligent thrive: “The sluggard craves and gets nothing, but the desires of the diligent are fully satisfied” (13:4); “He who works his land will have abundant food” (12:11); “All hard work brings a profit” (14:23); “The plans of the diligent lead to profit as surely as haste leads to poverty” (21:5); and “Do you see a man skilled in his work? He will serve before kings” (22:29). The apostle Paul also understood the value of work: “If a man will not work, he shall not eat” (2 Thessalonians 3:10). Proverbs has much to say about riches and poverty. Even though wisdom, understanding and knowledge are far more precious than wealth (8:10, 19; 16:16), riches do have value: “The wealth of the rich is their fortified city, but poverty is the ruin of the poor” (10:15); and “The rich rule over the poor, and the borrower is servant to the lender” (22:7). Money is a power, and it can be put to good use. However, the rich must not become so engrossed with material wealth that they neglect their spiritual responsibilities. In the end, it is not riches but righteousness that is important (11:4). Of course, like everyone else, the rich must meet material obligations to God: “Honor the Lord with your wealth, with the firstfruits of all your crops” (3:9). They should also remember the poor: “He who gives to the poor will lack nothing, but he who closes his eyes to them receives many curses” (28:27). The proverbs are therefore in agreement with the law — human beings should love God (Deuteronomy 6:5) and neighbor (Leviticus 19:18). The proverbs stress that the most important thing in life is not wealth but one’s relationship with God: “Rich and poor have this in common: The Lord is the Maker of them all” (22:2); and “Wealth is worthless in the day of wrath, but righteousness delivers from death” (11:4). The book of Proverbs has stern warnings for scorners and scoffers who refuse to accept rebukes: “A wise son heeds his father’s instruction, but a mocker does not listen to rebuke” (13:1); and “A mocker resents correction; he will not consult the wise” (15:12). Scorners are those fools who mock at making amends for sin (14:9), make light of justice (19:28) and are proud and arrogant (21:24). The wise person will drive out the mocker, and strife will cease as a result (22:10). In the end, “penalties are prepared for mockers, and beatings for the backs of fools” (19:29). Rebuke, or reproof, is a theme dealt with extensively throughout Proverbs. The Hebrew word for reproof, tokhachath, is used 16 times in Proverbs and only eight times in the rest of the Old Testament. Wisdom despairs at those who refuse her rebuke (1:25, 30). Those who ignore correction lead others astray (10:17) and are stupid (12:1). In addition, those who hate correction will die (15:10). On the other hand, those who heed correction are prudent (15:5). They shall gain understanding (15:32) and be honored (13:18). The other side of the coin is instruction. The Hebrew word for instruction, musar, occurs 30 times in Proverbs and only 20 times in the rest of the Old Testament. A wise person will listen to the instruction of both parents: “Listen, my son, to your father’s instruction and do not forsake your mother’s teaching” (1:8). Instruction is more precious than silver (8:10) and is the way to wisdom: “Listen to my instruction and be wise” (8:33); and “Listen to advice and accept instruction, and in the end you will be wise” (19:20). Instruction leads to life: “He who heeds discipline shows the way to life” (10:17). Correction and instruction are part of a Christian’s life. We must learn to accept correction when we are at fault. We must also continually receive instruction as to how we can better live God’s way of life. Slanderous words are quickly believed by people who listen to talebearers. Such words do not just make a superficial impression — they corrupt the innermost being of the listener. Whereas, “without gossip a quarrel dies down” (26:20), a talebearer causes strife. Simply put, “A gossip betrays a confidence, but a trustworthy man keeps a secret” (11:13). Specifically, we should not make other people’s sins public knowledge: “He who covers over an offense promotes love, but whoever repeats the matter separates close friends” (17:9). How much grief has been caused by not applying this one basic principle! God tells us to avoid talebearers and gossips: “A gossip betrays a confidence; so avoid a man who talks too much” (20:19). Lying is condemned in no uncertain terms: “Truthful lips endure forever, but a lying tongue lasts only a moment” (12:19); “The Lord detests lying lips, but he delights in men who are truthful” (12:22); and “Like a club or a sword or a sharp arrow is the man who gives false testimony against his neighbor” (25:18). Nor are we to boast about our achievements: “Let another praise you, and not your own mouth; someone else, and not your own lips” (27:2). Often, the best course of action is to keep silent: “When words are many, sin is not absent, but he who holds his tongue is wise” (10:19); “Even a fool is thought wise if he keeps silent” (17:28); and “A fool gives full vent to his anger, but a wise man keeps himself under control” (29:11). Proverbs emphasizes that “an evil man is trapped by his sinful talk” (12:13) and “a fool’s mouth is his undoing, and his lips are a snare to his soul” (18:7). We can use the tongue positively, however. All those who give righteous instruction are commended: “The lips of the righteous nourish many” (10:21); “Kings take pleasure in honest lips” (16:13); and “A word aptly spoken is like apples of gold in settings of silver” (25:11). However, the righteous will rebuke, if necessary, rather than flatter a person (28:23). Throughout the book of Proverbs, the words of the righteous and the wicked are contrasted: “The mouth of the righteous is a fountain of life, but violence overwhelms the mouth of the wicked” (10:11); “The tongue of the righteous is choice silver, but the heart of the wicked is of little value” (10:20); “Reckless words pierce like a sword, but the tongue of the wise brings healing” (12:18); “The tongue of the wise commends knowledge, but the mouth of the fool gushes folly” (15:2); and “The Lord detests the thoughts of the wicked, but those of the pure are pleasing to him” (15:26). In short, “the tongue has the power of life and death” (18:21). Chapter 30 of Proverbs contains the sayings of Agur, the son of Jakeh. We know nothing else about this man, but the wisdom within this chapter shows him to be an unusually astute observer of life. He summed up the proverbs on riches and poverty by saying: “Give me neither poverty nor riches, but give me only my daily bread. Otherwise, I may have too much and disown you and say, ‘Who is the Lord?’ Or I may become poor and steal, and so dishonor the name of my God” (verses 8-9). A number of Agur’s proverbs are organized into sets of four observations. He notes that four things are never satisfied: “the grave, the barren womb, land, which is never satisfied with water, and fire, which never says, ‘Enough!’” (verse 16). He also identifies four things that the earth cannot bear: “a servant who becomes king, a fool who is full of food, an unloved woman who is married, and a maidservant who displaces her mistress” (verses 22-23). Four things Agur mentions as too amazing for him to understand: “the way of an eagle in the sky, the way of a snake on a rock, the way of a ship on the high seas, and the way of a man with a maiden” (verse 19). And four things Agur observed as moving with stately bearing: “a lion, mighty among beasts, who retreats before nothing; a strutting rooster, a he-goat, and a king with his army around him” (verses 30-31). These sayings have a “there are three, no there are four” type structure, which puts the emphasis on the last item. For example, Agur’s real fascination is in regard to “the way of a man with a maiden”; and his real admiration is for a king at the head of his army. King Lemuel may have come from the kingdom of Massa in northern Arabia. The Hebrew word translated “oracle” in Proverbs 30:1 and 31:1 is massa’, which some scholars translate as the place Massa. Proverbs 31:1-9 contains a mother’s advice about the responsibilities of a monarch. In two short sentences, Lemuel’s mother enunciates one of the king’s most important duties: “Speak up for those who cannot speak for themselves, for the rights of all who are destitute. Speak up and judge fairly; defend the rights of the poor and needy” (verses 8-9). If the kings of Israel and Judah had applied this one principle, God would not have needed to send prophet after prophet to denounce the gross injustices perpetuated in those nations.